This quartet first performed in Halifax in 2017 at Kinetic Studio. There was an instant fusing of sound and movement that couldn’t be ignored! These four are equal improvisers and their performances are free, connected, and focused. 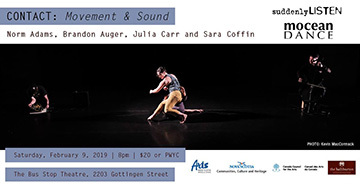 Sara and Julia are contact improvisers, experts in the exploration of the body in relationship to others using the fundamentals of sharing weight, touch, and movement awareness. It’s really listening through physical awareness. Norm and Brandon have performed and worked together as Strata for 3 years, and both make musical structures through maximum listening and interweaving of minute melodies and texturesclock.